I came across Halie Ranee’s YouTube page over a year ago and instantly fell in love with her. She is so unique, kind, talented – has an amazing voice. If you watch the video above you already know that she explains that she has depression. My heart goes out to her as I went through a very similar situation when I was in high school. For people that don’t have depression you really can’t understand what someone with depression is really going through. See, you already live with your heart and you can find joy and contentment in things, events, friends and experiences. When I was in school I had depression but it was never diagnosed or dealt with. Looking back one thing was for sure I was constantly living in my head! I was constantly worrying what if, what people were thinking about me, their opinion mattered over my own. I knew I didn’t want to live like this and knew there was something better and more for me out there. Just like Halie using her music as a release and a healthy way to escape and deal with her emotions I turned to lifting weights. Here are some of my favorite renditions of popular songs Halie has covered! I hor you like them! 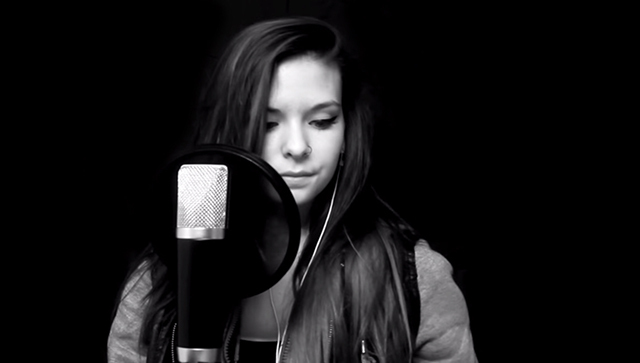 Brave – Sara Bareilles (Cover) National Coming Out Day! We love Halie Ranee – YouTube Personality! She has an amazing voice, awesome tutorials, and shares her private life with her girlfriend with Lauren. We love you Halie! Keep making music and being you! This entry was posted in Women Crush and tagged covers, Hailie Ranee, singing, woman crush wednesday, Womancrushwednesday, youtuber by Janey Grace. Bookmark the permalink.